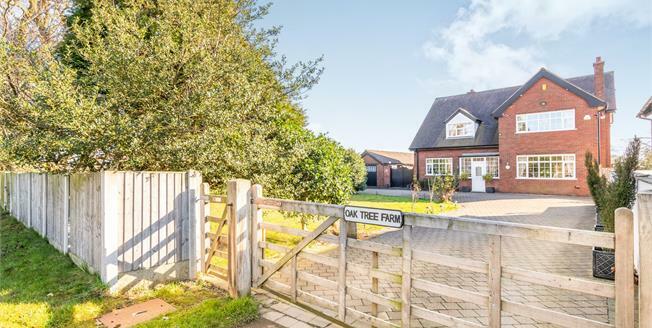 This property's price has dropped from £680,000 to Offers Over £650,000. Internal inspection of Oaktree Farm is imperative to appreciate the size and standard throughout. The property is approached via gated access with parking for numerous vehicles. The ground floor briefly comprises an entrance porch, study, large hallway, two reception rooms both with feature fireplaces with the rear lounge having French doors out to the extensive south facing garden, a country kitchen with oak units, built in dishwasher and Belfast sink leading to an orangery with bi-fold doors out to a decked area, a utility room and WC are also off the kitchen. Upstairs boasts three double bedrooms, two with walk in wardrobes, all served by a four piece family bathroom. Externally the gardens are mainly laid to lawn with a detached garage and additional storage facilities.